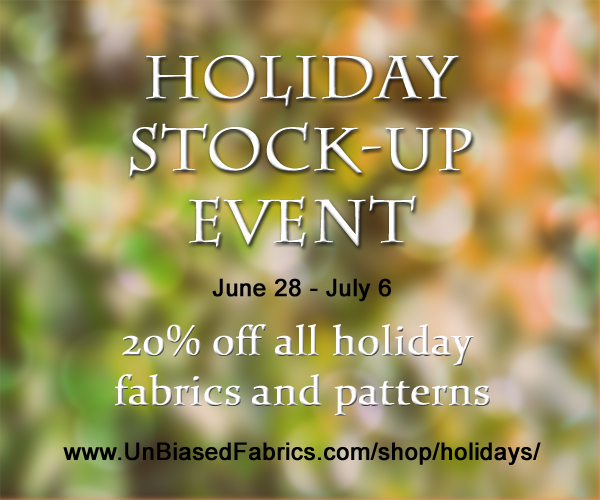 All our holiday theme fabrics and patterns are 20% off!. Click this link or the photo below to see the selection. Unbiased Fabrics and Oak Hill Fabrics are now one company with a new name! "Gardensong Fabrics"
- still the best fabrics, patterns, notions and customer service. The name will begin appearing everywhere as we transfer data. Be sure to watch our Facebook page for more news. or found our website. Stay signed up to receive news of new products, events, and sales.